Vanderbilt is home to both training and core grants from the National Eye Institute (NEI) of the National Institutes of Health; Vanderbilt scientists serve as principal investigators on nearly 30 multi-year awards from the NEI, representing the College of Arts and Sciences, School of Engineering, School of Education, and School of Medicine. Together, these faculty and their staff and trainees comprise the Vanderbilt Vision Research Center. Within the Vanderbilt Eye Institute, multiple translational laboratories directed by dedicated research scientists and clinician-scientists collaborate on understanding fundamental mechanisms of eye disease and on testing therapeutic targets. Our research is focused on four broad initiatives formed by strategic collaborations involving teams of Vanderbilt Eye Institute faculty. These initiatives are fueled by simple goals. Interventional Medicine seeks more potent, but less invasive surgical therapies based on earlier and more sensitive diagnosis of common conditions such as strabismus, amblyopia and ocular trauma. Vascular Biology & Nanotechnology seeks new therapeutic tools that use the vasculature as a roadmap to direct drug delivery where needed to the retina and optic nerve for diseases such as macular degeneration and retinopathy of prematurity. The initiative in Pharmacogenomics & Human Genetics is focused on personalized treatment regimens for glaucoma, macular degeneration and diabetic retinopathy constructed from genetic information from individual patients. 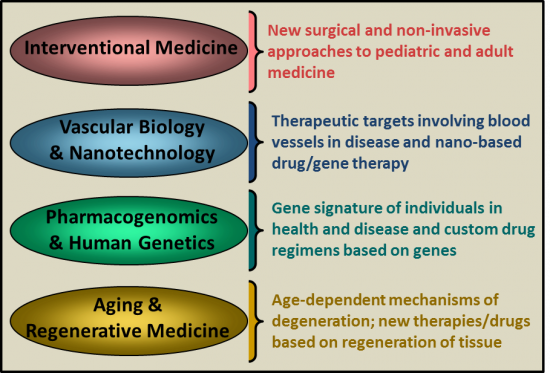 Finally, our program in Aging & Regenerative Medicine seeks to apply gene therapy, drug discovery and tissue remodeling to restore lost function to the retina and optic nerve following disease or injury. Together, these initiatives define an interdisciplinary approach to the most common causes of vision loss facing society today.